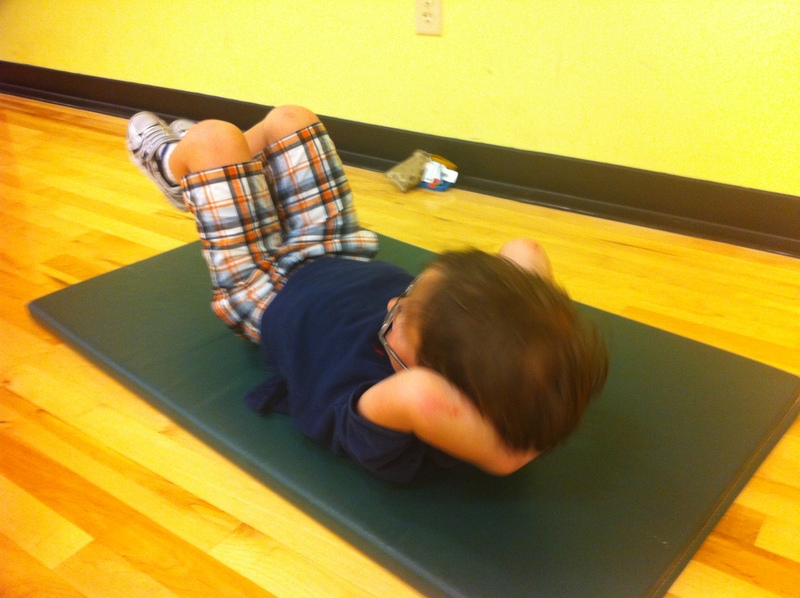 …yesterday happened during kickboxing class at the Y. You see, kickboxing class is from 7pm-8pm. But Margaret (our instructor) always holds a mini-abs session for about 10-15 minutes after the actual class ends. Yet, child care at the Y (on weeknights) ends at 8pm, so either Jayme or I have to go get the kids before class really ends and then come back. Last night, I went to gather the kids and brought them back downstairs to the classroom. They know what to do by this point, and they took their place against the wall and I went to grab one of the mats for abs work. I’m straining like crazy (this is ab work, after all). Then I see Jayme smiling at something and look over to see what it is. Brian has somehow gotten a mat and is now doing ab work with us. And not slouching at it either. I smiled. A proud smile. A wonderful feeling smile. I got up, grabbed my iPhone and took a picture. That’s my boy!